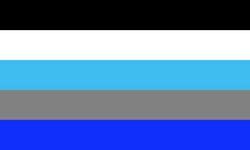 Demigender (from demi "half" + "gender") is an umbrella term for nonbinary gender identities that have a partial connection to a certain gender. 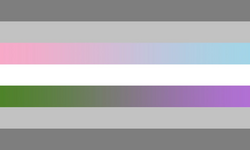 This includes the partly female identity demigirl, and the partly male identity demiboy. There are other partial genders using the "demi-" prefix for the same reasons. For example, deminonbinary, demifluid, demiflux, and so on. 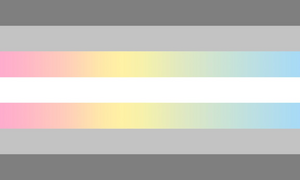 Like nonbinary, demigender is also an identity within itself, for people who feel connection to the concept of gender rather than certain genders. Being a demigender "is not dependent on how much (as in percentage) someone identities as one gender; it solely depends on if a person identifies as partially. For some, they may identify with two or more genders while others may not." 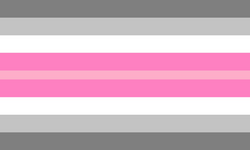 The demigirl flag by Transrants. Pink: female. White: agender or nonbinary gender. Gray: partial. A demigirl is someone who only partially (not wholly) identifies as a girl or woman, whatever their assigned gender at birth. They may or may not identify as another gender in addition to feeling partially a girl or woman. May also use the terms demigal, demifemale or demiwoman. Alternatively, demigirl can be used to describe someone assigned female at birth who feels but the barest association with that identification, though not a significant enough dissociation to create real physical discomfort or dysphoria, or someone assigned male at birth who is trans feminine but not wholly binary-identified, so that they feel more strongly associated with “female” than “male,” socially or physically, but not strongly enough to justify an absolute self-identification as "woman". 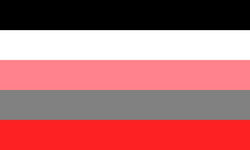 The demiboy flag by Transrants. Blue: male. 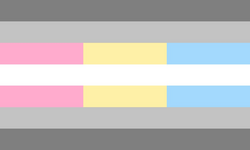 White: agender or nonbinary gender. Gray: partial. A demiboy, also called demiguy, is someone whose gender identity is only partly male, regardless of their assigned gender at birth. They may or may not identify as another gender in addition to feeling partially a boy or man. They may also define their identity as both male and genderless (agender). Alternatively, demiguy can be used to describe someone assigned male at birth who feels but the barest association with that identification, though not a significant enough dissociation to create real physical discomfort or dysphoria, or someone assigned female at birth who is trans masculine but not wholly binary-identified, so that they feel more strongly associated with 'male' than 'female,' socially or physically, but not strongly enough to justify an absolute self-identification as 'man'. 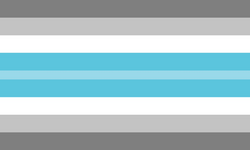 The deminonbinary flag by Transrants. 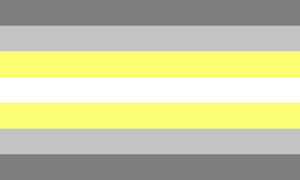 Yellow: nonbinary. 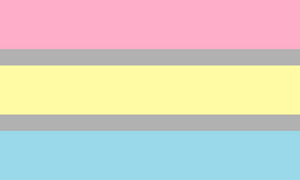 White: agender or nonbinary gender. Gray: partial. Deminonbinary, or demienby, is a gender identity for someone who partially identifies as nonbinary. 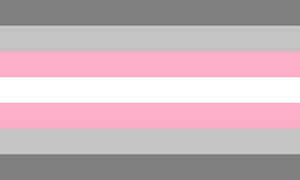 Demifluid is a gender identity for "someone whose gender is partially fluid (genderfluid) with the other part(s) being static; an example could be: one part of their gender is 'woman' while the part that fluctuates is 'man' and 'genderqueer'." In other terms, one part of the gender is static while the other part changes between genders. Demiflux is a gender identity for "someone whose gender is partially fluid with the other part(s) being static; this differs from 'demifluid' as '-flux' indicates that one of the genders is neutral; an example could be: one part of their gender is 'genderqueer' while the part that fluctuates is 'agender' and 'woman'." In other terms, one part of the gender is static while the other fluctuates in intensity; for example, one part of the gender is 'genderqueer' and the other is 'woman' of fluctuating intensity. See also a blog post about this topic on our Tumblr. This page was last edited on 1 April 2019, at 18:37.